(Irvine, California) August 23, 2017— Today HI-CHEW, the sensationally chewy, long-time #1 soft candy in Japan and new American favorite, unveiled their latest project: the renovation of the El Toro High School softball field, home of The Chargers in Lake Forest, California. With HI-CHEW’s U.S. headquarters based nearby the Lake Forest area, the company has been longtime supporters of the local community and heard of the need for a field renovation due to wear and tear over time. HI-CHEW funded the construction and was an active participant in the revamping of the field. El Toro High School, whose baseball team has an impressive legacy with eight league championships won is eager to set the school’s softball team up for equal success with the help of HI-CHEW. The field renovation included a new fence surrounding the outfield, grading for the bullpens, a new stonewall at the backstop of the field and overall field refurbishment ridding any weeds and gravel. In addition to receiving the new field, The Chargers softball team accompanied by their head coach, Shannon Tinsley, were invited to throw the first pitch at Dodger Stadium this past Sunday, where the field makeover was announced and shared with the greater L.A. community. 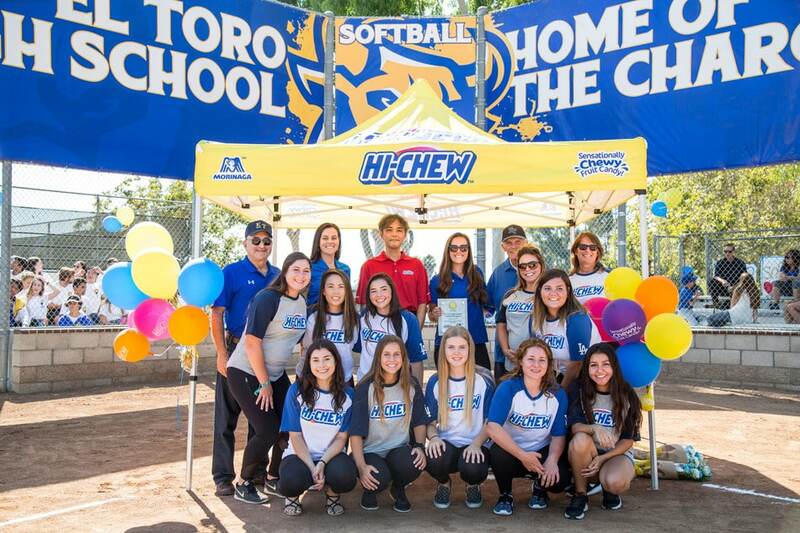 On Tuesday, HI-CHEW and the El Toro High School softball team and their families celebrated the official opening of the field with a ribbon cutting ceremony. Representatives from Morinaga America, Inc. were there alongside head coach Shannon Tinsley, athletic director Armando Rivas and Stella Escario-Doiron, Chief Facilities Director for the Saddleback Valley Unified School District.